The Riau Islands (Indonesian: Kepulauan Riau, abbreviated to Kepri) are an archipelago in Indonesia, located east of Sumatra. Two islands are south of Singapore. The Riau Islands Province came into existence in July, 2004, when it was separated from neighboring Riau Province on the island of Sumatra. It includes the islands of Karimun, Batam, Bintan, Singkep-Lingga, and the Anambas and Natuna island groups in the South China Sea. Though Kepri is a new addition to the political map of Indonesia, the far-flung islands of this archipelago make up one of the most important historical regions in the country. An archipelago of over 3,000 islands, the region has benefited greatly from its location: straddling the sea routes between the Indian Ocean and the South China Sea. For thousands of years traders and pirates alike have taken advantage of its relatively calm and shallow waters, along with its many safe harbors. The earliest Malay kingdoms may have arisen in Sumatra but their prosperity relied on trade through these islands, while their navies were supported by the Orang Laut (literally "sea peoples") who lived in the archipelago. After the destruction of the Malacca Sultanate at the hands of the Portuguese in 1511, the Riau Islands and neighboring Johor (in Malaysia) became the center of a powerful successor sultanate. The Riau-Johor Sultanate, with its chief port near present-day Tanjung Pinang, reached the height of its power in the late 17th and early 18th centuries, though it eventually succumbed to internal disputes, slave raiding by the Sulu Sultanate, and a war with the Dutch East India Company in 1784. By the early 1800s trade had moved elsewhere and the islands were split by a succession dispute between two sons of the recently deceased Sultan Mahmud. In 1819 an agent of the British East India Company promised to support one of the sons' (Sultan Hussain's) claim to the thrown in exchange for allowing him to set up a settlement that would become Singapore. An Anglo-Dutch treaty in 1824 divided the archipelago into two spheres of influence, splitting the former sultanate between Singapore and Johor on the British side and the Riau Islands on the Dutch side. Strung between Singapore and Batavia (present-day Jakarta), the Riau Islands declined in economic and political importance in the 19th and 20th centuries. However, the area remained a center of Malay culture and Islamic learning in Southeast Asia and many historic buildings, especially on Penyengat Island near Tanjung Pinang, remain from this period. The province still lies on some of the most important shipping routes in the world and, for better or worse, it is firmly embedded in the greater Singaporean economy. Some of the Riau Islands are within eyesight of downtown Singapore, while others are hundreds of kilometers away from anything. Because of this, the province offers many different experiences to a traveller. The luxury resorts on the north coast of Bintan and the much seedier towns of Batam are a short ferry ride from Singapore. Historic and ethnically-diverse Tanjung Pinang, the capital and largest town on Bintan, is further away but still easy to reach. Lingga and Singkep islands are much further afield and have become a favorite destination for cycling enthusiasts from Singapore. At the furthest extreme, the Anambas and Natuna Islands are the realm for divers and adventurous backpackers. Karimun - an island west of Batam popular for its granite mine. The island also has a few beautiful beaches. Bahasa Indonesia is modeled on the version of Malay which originates from the Riau Islands. In fact, Riau Malay is regarded as the purest form of the Malay language and visitors from Malaysia will find the Malay spoken here very similar to Bahasa Malaysia, which is the version of Malay spoken back home. Many of the islands, especially Batam, Bintan, Karimun and Kundur, have huge Chinese populations who speak Hokkien and Teochew as well as Mandarin. The Riau Islands are a major gateway into Indonesia because of good ferry links to nearby Singapore and Malaysia. For detailed visa information, please see the Indonesia page. Many of the seaports in the Riau Islands and the main airport on Batam are visa-free and visa-on-arrival points of entry. Please see the pages for the individual islands or cities on the visa status for a particular port. Batam's Hang Nadim Airport (BTH) is the main airport in the province and fields flights from various Indonesian cities. It has connections with cities in the Sumatra "mainland" such as Banda Aceh, Pekanbaru, Bengkulu, Palembang, Jambi, and Pangkal Pinang, Medan, and other part of Indonesia such as Jakarta, Surabaya, Yogyakarta, Semarang, Pontianak, Bandung, and Balikpapan. 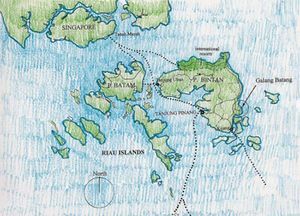 See the Batam and individual city pages for details on connections. As for international connections, Malindo Air operates flight from Batam to Subang-Kuala Lumpur. Ferries are the main way to get to the Riau Islands. Check the individual island or city pages for details. From Malaysia: Frequent ferries link Johor Bahru with Batam and Bintan. Ferries also run between Kukup in the south western part of Johor state, and Tanjung Balai on Karimun Island. As of mid 2007, a ferry service has been planned for Batu Pahat in Johor and Tanjung Balai on Karimun but has not taken off yet. From other parts of Indonesia: Numerous ferries link Sumatra mainland cities such as Pekanbaru, Dumai, Palembang, Kuala Tungkal in Jambi and other smaller ports with Batam, Bintan, Karimun and other islands. Ships belonging to Indonesia's passenger shipping company Pelni call at Bintan's Kijang port, Batam's Sekupang domestic ferry terminal and the Natuna Islands, linking them with Jakarta, Medan, Pontianak and other major ports. One of the typical crowded ferries linking the various Riau Islands. Boats are the only practical means of traveling through the archipelago. There are very frequent ferries between Batam and Bintan. Frequent ferry links the two islands with other islands in the province like Karimun, Singkep and Lingga. The remote Natuna and Anambas islands are linked by infrequent ferries and Pelni boats from Bintan. For more details, please see the pages for the individual islands. There are airports on Batam, Bintan and the remote Natuna Islands, where there are airstrips on Natuna and Matak. The main airline linking the various Riau islands is Riau Airlines. It also offers flights south to Singkep Island (Dabo) from Batam and that is a viable option rather than spending 3-6 hours on a ferry. In terms of land transport, local transport in the form of taxis, buses, vans (angkut, bemo), and motorcycle taxis (ojek) are available on most islands. It cost a dollar or two, it depends how long the trip is. However, to enjoy the island even more try to rent your own motor bike ("rental moto") It starts at 50'000 Rupias (3.2 €uro)/day when there are space to bargain, but on smaller islands they know they can charge more, up to 100'000 Rupias/day. In the capital of the Riau province Tanjung Pinang will you find many historical attractions. The famous Buddhist Temple and Penyengat Island. With the famous Mesjid Raya Mosque made by egg. Include the unique building, it's much a spiritual island.To be there you smell the glorious history of Indonesia, yoe can find the parts of the kings palace. Several mausoleum of royalties and a spirit of old religion. The mysterious of Indonesia, this is maybe the place. Good/evil, black/light, animism. The old ruler's palace and royal tombs, among them the grave of the respected Sultan Haji, who also was creator and author of the first Malay Language grammar book, are among the legacies left by the Riau sultanate. Still in use is the old vice-royal mosque, the Mesjid Raya. Riau has many fantastic beaches. The cultural center for stage performances of Malay music and dances is located in Tanjung Pinang. The center organize regulary festivals and other cultural performances, such as music and dance. Under construction, just off Batam is an Eco resort going is named Funtasy Island. They claim that they will preserve 70% of all the mangroves and trees etc. Building 450 villas. The province is famous for it seafood restaurants, in capital you will find many first class seafood restaurants to very low price compared to the western world and Singapore. Indonesia is famous for coffee and tea. The Avocado juice is also a must-try! Hotels of various budgets are available in the main towns such as Tanjung Pinang on Bintan, Nagoya on Batam, Tanjung Balai on Karimun and Tanjung Batu on Kundur, although those at the lower end are often sleazy and unpleasant. Five-star beach and golf resorts, catering mostly to Singaporeans, are also popular in this part of Indonesia, mostly located in the Bintan Resorts area on the northern part of the island. There are also resorts on the other islands, eg. Nongsa on Batam. See the individual city/island pages for listings. Bear in mind that the economic boom has made accommodation in the Riau Islands more expensive than in other parts of Indonesia. Riau province is a safe place, with a very low crime rate. Riau doesn't have night life as the western world, but people hang out in the street in the night. So just go out and see how the locals enjoy their evening. The island of Batam is home to many clubs and bars, catering to the large Western expat population working at the engineering companies, and the younger locals. Be aware of prices, which are quite high in the hotel bars and clubs, and of illegal drugs, which are widely available but dangerous.